Records of the early education in Wymeswold relate to teachers not to schools. 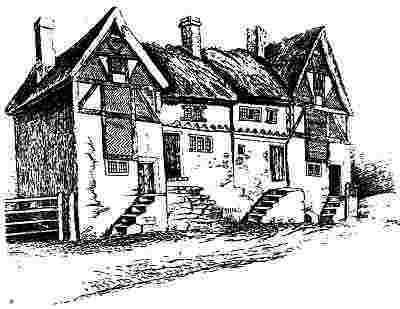 In 1575 the parish clerk, William Nelson, was also a schoolmaster. The parish register records the baptism in 1612 of Ann, daughter of John Darcie, schoolmaster. He had no diocesan registration. A town school, the building of which is not recorded, existed in the north-east of the churchyard until it was demolished in 1835. On the land at the corner of Wysall Lane stood the Ballard mansion which was later subdivided and purchased by William Thompson who then sold it for parish lands and houses in 1782. This was handed over to trustees for an infant's school which was erected on the site in 1838. Ballard's cottages from an undated illustration of before 1838. An endowed, free parish school was erected in 1846 in Brook Street, by the trustees towns and Thompson's charity. In 1845, at the instigation of Rev Henry Alford, land was purchased opposite the church for the erection of a national school. This is now a house. This was replaced by the characteristic school building, now a house, near the church. The present primary school in The Nook off Brook Street was built in 19***. 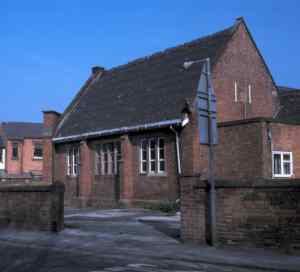 The 20th century primary school in 1987 before conversion to a house. There were other schools, mainly small and private, in the 18th and 19th centuries e.g. Miss Mason's at Lower Fields, the Misses Potter at The Hermitage and a British school. Thomas Russell Potter and the Rev Alford were both responsible for higher education. Most interesting school how was however, that run by Jenny Hickling. Jenny was born in 1747, one of three children whose parents rented a farm in Far Street. At the age of 13 she developed a palsy and, although she made a partial recovery, was confined to bed. She managed to teach 30 children to read, sew and mark. She managed the children with kindness but, if children misbehaved, they were pinned to the bedclothes with their backs to her. In addition to teaching, she made garments and helped with the brother's and sister's children. She died in 1822 and was buried in the Baptist churchyard. Joseph Thompson, a Quaker, who died in 1733, left a will which states: "I given and bequeath unto the feoffees of the town of Wimeswould aforesaid for the time being the sum of �0 to be paid within 12 months next after my decease and it is my mind and will that as soon as the dais feoffees have received the said sum of �0 that they put the same out to interest and the interest arising from the said sum of �0 shall be applyed for and towards the education of ten poor boys to be taught to read, write and cast accounts in the town school of Wimeswould, aforesaid." 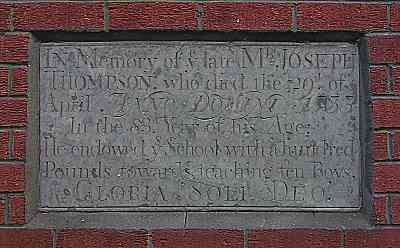 The inscribed stone commemorating Thompson's bequest, now on the wall of the present school. Ten acres of land were purchase at Burton with the legacy, the rents providing the income. A plaque record this was first erected on the parish school but it now stands in front of the present primary school. The school log books from the last century make interesting reading. They show that holidays were granted for Ascension Day, for Sunday School treats and for the Loughborough flower show. On several occasions the teacher reported low attendance. In 1889 children went absent to help in the hay fields. In May 1890 some children could not attended as the parents could not afford the fees. On February 24th 1879 the school was closed because of snow and in December 1900 because "children have gone after the hounds" (the Quorn met at Wymeswold). The strangest record of absence occurred in 1896. "The coltsfoot season is causing a good deal of irregular attendance. Wine is made from coltsfoot flowers. A peck of flowers is worth 8d. A boy can gather a peck in an afternoon." An entry on June 23rd 1897 records that "the children are drowsy and tired following the Queen's Diamond Jubilee celebrations. Several boys went to sleep." Prices were awarded for needlework in 1886 to Kate Allen, Arthur Bates and Louisa Hubbard, and in 1887 to John Brain and Grace Lamb. Text cards were awarded in 1887 to Kate Allen, Arhtur Brooks, Annie Clarke, Elizabeth and John Hubbard, Mary and Thomas Pepper and Sarah Ann Wye for religious knowledge.